Pearl Jam will play two stadium shows in their hometown of Seattle, WA this summer to benefit homelessness initiatives in the city. Billed as “The Home Shows”, the August 8 and 10 events at Safeco Field will see the band pledge a minimum of $1 million toward local initiatives while challenging everyone to join them towards raising a minimum of $10 million for the cause. The rockers are also researching a wide range of programs to address Seattle-area homelessness in varied ways with a plan to announce specific beneficiaries closer to the show dates. Pearl Jam joins a growing list of area businesses, government agencies, nonprofits and members of the creative community who are collaborating to tackle the biggest public health crisis to hit the west coast community in recent history. Partners to date include City of Seattle, Seattle Mariners, Starbucks, Amazon, Ethan Stowell Restaurants, Port of Seattle, Visit Seattle, KISW, 107.7 The End, KEXP and the Schultz Family Foundation. “We must have everyone in the fight to solve homelessness including our local government, caring philanthropists, community organizations, individuals, and artists - all are dedicated to finding innovative long-term solutions to homelessness,” adds Seattle Mayor Jenny Durkan. The Home Shows mark Pearl Jam's first hometown appearance in 5 years, plus the largest headlining concert event in Seattle since The Rolling Stones' two-night stint at the Kingdome in 1981. 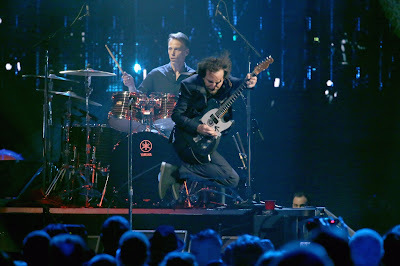 Following their induction into the 2017 Rock And Roll Hall Of Fame, Pearl Jam released their concert film, “Let’s Play Two”, last fall. The group will return to live action in March with a series of South American shows and will tour Europe in the fall.